Perino del Vaga worked for a time under Raphael, and during the 1520s established himself as one of Rome's leading fresco painters. This is a study for two of the Evangelists - St Mark with his lion, and St John with his eagle - painted by Perino in the vault of a chapel in San Marcello al Corso. The project was interrupted by the Sack of Rome in 1527 and was completed (by Perino's assistant Daniele da Volterra) only in 1543. In May 1519 the church of San Marcello, on the Corso in Rome, was destroyed by fire. Among the ruins was found an intact wooden crucifix, which was thus held to have miraculous properties and was carried in procession during the plague of 1522. The subsequent abatement of the plague led Cardinal Guglielmo Raimondi di Vich to found the Confraternità del Santissimo Crocifisso, whose first artistic initiative was the decoration of a chapel erected to house the miraculous crucifix as part of the rebuilding of San Marcello. Perino del Vaga began work in the chapel at an unknown date, but a lack of funds brought work to a halt, and on 6 February 1525 the artist signed a new contract with the confraternity. 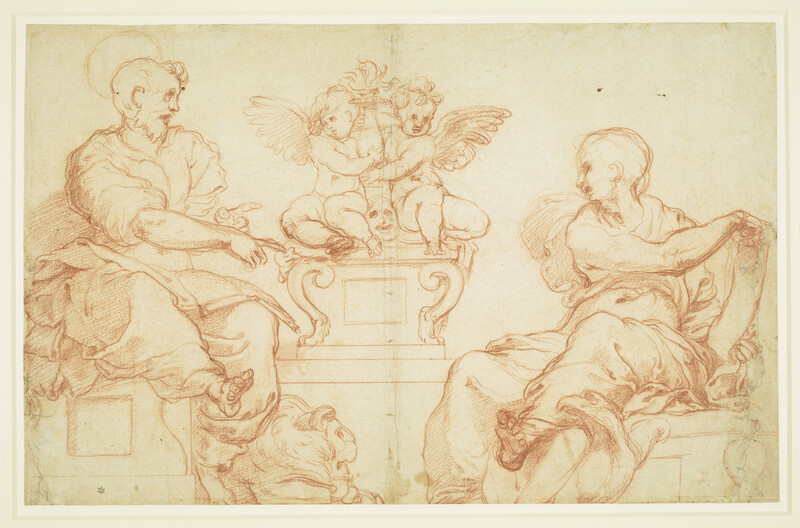 By the time of the Sack, Perino had painted a Creation of Eve in the crown of the vault, and much of the flanking figures of St Mark with his lion and St John with his eagle, which derived from this study. Work then fell into abeyance until Perino returned to Rome a decade later. A revised contract was signed on 25 April 1539, Perino delegating the work to his assistant Daniele da Volterra, who by May 1543 had completed St John and added the figures of St Matthew and St Luke (to a revised design) on the other side of the Creation of Eve. It is not known whether frescoes were ever planned for the side walls, which remained blank. A damaged study in Berlin records Perino's initial design for the vault, with God the Father in the central field. The subsequent substitution the Creation of Eve may seem an odd choice of subject for a chapel dedicated to the Crucifixion, but St Augustine had seen in the creation of Eve, from the rib taken from Adam's side, a prefiguration of the blood and water that issued from the wound in Christ's side on the Cross. The figures of the Evangelists in the Berlin drawing are squared with black chalk, and Perino transferred the poses of the saints to the present sheet by incising it with an equivalent squared grid before beginning work with the chalk. The positions of the Evangelists within the grids do correspond, but Perino here began the figure of St John a square too low, and the two figures are thus out of register. The process of transcribing the design from one sheet to another exaggerated the abstract linearity of the figures, and St John's eagle almost merges with his drapery. Nonetheless, Perino was clearly responsive to the solidity of Michelangelo's prophets, sibyls and ignudi (male nudes), painted fifteen years earlier in the Sistine Chapel, and one can see how the young artist attempted to reach an accommodation between the apparently conflicting examples of Michelangelo and his one-time master, Raphael. This drawing was recorded in the collection of the minor Roman nobleman Antonio Tronsarelli, posthumously inventoried in 1601. The drawing bears a six-pointed star and the inscription Jerom on the verso, probably indicating that within a few decades the drawing was in the collection of Jerome Lanier (d. 1657).